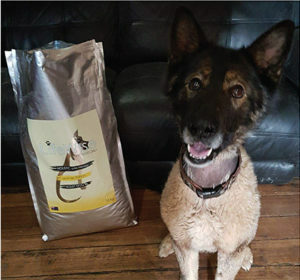 This is Buddy’s story as told by Trudi Petersen of German Shepherd Rescue Tasmania. Buddy came to us on the 27th of June and he was a mess, his fur was missing from his neck and a lot of his body. The coat that he had was similar to a newborn lambs wool. He was a character from the start and we started by giving him a feed and a warm bed. We got him to the vets as soon as possible and discovered that his hair loss was a combination of diet, hormones and environment. So he was booked in for desexing, and he started on the road to recovery. When we started him on the LifeWise grain free Turkey it was a game changer. Within two weeks the hair on his neck started to come in, and also his groin area and back and chest. Buddy has now been on the LifeWise food for three months and he is a different dog. The new and improved Buddy is a testament to the food he is eating, his coat is the softest of all the dogs and he is also much calmer and relaxed. His black damaged skin is being replaced by a soft pink as the new hair grows and we are now seeing his true colour starting to show through the light undercoat. There are black and even red hairs growing in. He now only has a couple of very small areas that are still growing hair and within a few weeks I suspect they will also be covered. Buddy’s neck hair regrowth and recovery. This boy has been responsible for many tears (mostly tears of joy) when people see the amazing recovery he has made… thank you LifeWise!